The Platform is available with a Cold Standby on all its elements along with a Real-time Database replication. A continuos health check keeps track of the primary Server availability and in case of failure, scripts shift the traffic to the Secondary Server. The solution is pre‐integrated with SoftSwitch, Media Server, Real-time Prepaid & Postpaid Billing, Provisioning and Reporting. It is field proven with large Service Providers. Solution runs on industry leading Intel‐Linux‐JBOSSPostGreSQL infrastructure. There are no expensive Application Server or Database Licenses to be procured. Helps in partitioning the system for multiple White Label Resellers for quicker ROI. Single Platform means there are no multiple systems to be managed. The Platform can be provisioned and managed through web based Interfaces on PCs and Mobiles. 1,000 Ports or 10,000 Registrations (whichever happens earlier). 1 Server. Non Redundant Architecture. 10,000 Ports or 250,000 Registrations (whichever happens earlier). Upto 3 Servers. Cold Standby with Database Replication Architecture. SIP SoftSwitch RADIUS AAA, REDIRECT & ENUM Server Support. NAT Traversal & Topology Hiding. Media Monitor (Disconnect Call on No Media). Caller‐Carrier PTIME isolation. Auto Inband, Outband DTMF over IP. Digit Manipulation & Number Translation. Advanced Routing Least Cost & Profit based Routing. LRN & MNP based Routing. Source & Destination based Routing. Prefix & Percentage based Routing. Preferred & Gateway based Routing. Route Capacity [Channels/CPS] Routing. Media Server (IVR) VXML 2.0 Interpreter. SIP INFO and RFC 2833. Multiple Language Support. Rates Management Destination based Rating. Pulse Customization. Date & Time based Rates Upload. CSV and Excel File Support. E.164 and E.212 Format Support. Real-time Billing Wholesale Tariff Management. Blocking & Unblocking of Destinations. Hierarchy based Billing. Re‐Rating. Individual Credit Limits for every Endpoint. Lower Balance Mail Alert. Prepaid Billing Registered & Anonymous User. Least Cost PIN based on destination. Top up with or without Rate Plan change. Transferring amount between the accounts. Configurable Period, Grace Period and PIN Life. Online Payment Gateway Integration. Packages Billing Cycle with Setup & Rental Fee. Free Calling for a Certain Amount. Free Minutes (Overall or Certain Destinations Only). Special Rates after Free Minutes. Metered usage charges. Percentage or Flat Fee based Surcharges & Taxes. Postpaid Billing Subscribers & Groups billing. Periodic Invoice Generation. Invoices in PDF and Excel Format. Call snapping on reaching Credit Limit. Online Payment Gateway Integration. Low Balance Announcement on call Initiation. Reseller Management 5 Levels of Resellers. Reseller White Labelling. Customized login pages for Resellers. Resellers can create own Billing Plans. Real‐time Billing Reports. Active Call Monitoring. Subscribers Individual Subscriber Registrations and Accounts. Mapping of Prepaid & Postpaid Billing Plans. N‐digit Subscriber Numbers. DID Management PSTN numbers (DID) mapped to IP Endpoints. Toll‐Free Number support on DIDs. DID Inventory Management..
CUG (Short Dialling) Formation of a group of subscribers. Short‐Dialling among group members. Escape Prefix to call out of CUG. Callshops Booth Creation. All Booths Activity on a Single Screen. Call monitoring of each Booth. Unbilled & Billed Calls information of each booth. Fund Addition. Prepaid Calling Card Prompts for Balance, Call duration & Recharge. Multiple Calls in the same Log‐In. PIN based Calling. PIN Less Calling. Favourite Number Service. Speed Dials for multiple Favourite Numbers. Callback Subscriber can initiate a CallBack by informing the Platform of the Source and Destination Numbers. IVR, Web & SMS Interfaces. System connects Destination and Origination Numbers and charges the Subscriber. Class 5 Features Caller ID or Name based on Caller, Origination Gateway or Termination Gateway. Caller ID Block. Anonymous Call Block. Call Hold. Music on Hold. Call Waiting. Absent Subscriber & DND. Call Return [Last Number Redial]. Call Forward [Every time, Busy, No Answer & Number Not Available]. Call Transfer [Attended & Unattended]. Find Me ‐ Follow Me. Simultaneous Ring. Call Pickup. Selective Outgoing Call Barring. Selective Incoming Call Block. Speed Dial. 3‐Way‐Calling (Device Feature). Voicemail Voicemail (Every-Time, Busy, No Answer & Not Available). Personalized greeting(s) on Voicemails. Auto Attendant Multi‐lingual IVR support. Voice menus to direct calls to Extensions / Groups. Announcements. Call Parking. Automatic Call Distribution Calls are routed to a group of phones. Simultaneous, Round‐robin or Sequential Distribution. Phones ring in one of the logics till the call is picked up. Enterprise Admin Interface IVR Prompts upload. Choose Pilot Numbers, Create Extensions & DIDs. Create Hunting & Voicemail Rules. View CDRs & Reports. 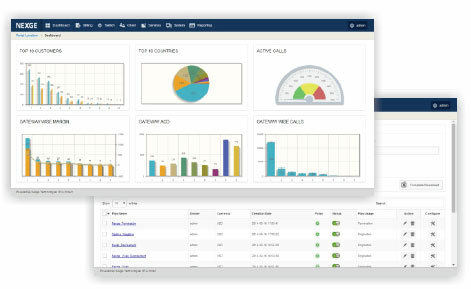 Web based GUI Feature Rich Graphical Dashboard. Web based Administrator, Reseller & User Portal. Detailed Carrier, User & Traffic Reports. Payments, Overdrafts & Fund Transfer Reports. Billing & Invoice Reports. Security Secure & Validated Remote Access. Validated IP Access. Role based Access Privileges & Control. Selective rights enabling / disabling for Users. Data Encryption for Critical Data Storage. Logging Configurable Log Levels. User Activity Logs on the System. Detailed Protocol Analysis through Ethereal. Web APIs for Custom Web Portals. APIs for third party OSS / BSS Integrations. APIs for Mobile App Integration. RADIUS AAA through standard Cisco VSAs. CDRs through Start & Stop Accounting. Multiple RADIUS Server Support with Failover. SIP REDIRECT Support for Single & Multiple Routes. Support for Parallel Trying. Support for Multiple REDIRECT Servers.